On May 12, Effigis sponsored the awarding of a scholarship to a Geomatics Technology student at the Cégep Limoilou. 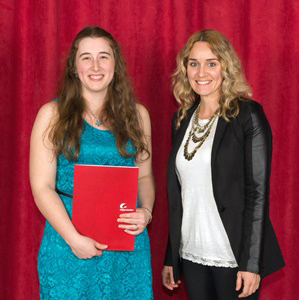 The scholarship, valued at $500, was awarded to Vanessa Desgagné (Geomatics program, Mapping option). The evening honoured academic success and personal development, and was presided over by the honorary president, singer Véronique Claveau, a former student of the Cegep. Congratulations Vanessa! Picture: Vanessa Desgagné (left) and Marie-Claude Fréchette, Marketing and Communications Manager at Effigis.